Sandhill Cranes - Gill, Franklin Co., MA. April 14th, 2018. A raw afternoon birding off Riverview Drive, Gill produced some nice sightings ahead of the forecast cold front promising freezing rain by dawn. 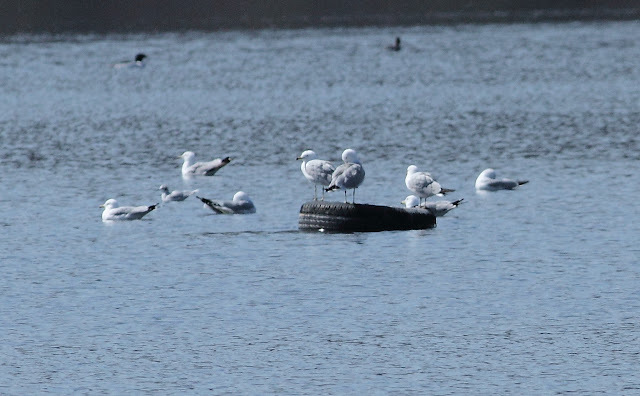 A Bonaparte's Gull dropped in to join a small number of Ring-billed and Herring Gulls on the water, and nine Double-crested Cormorants headed south flying straight over the five cormorants already present on Barton Cove. Two Ospreys also arrived whilst I was there with at least 20 Tree Swallows and a couple of Northern Rough-winged Swallows foraging overhead. Sandhill Cranes - Gill, Franklin Co., MA. April 14th, 2018. In flight directly above Main Road. On the drive home, Matan and I noticed two very large birds flying along the route of Main Road in Gill. They were relatively low and any thoughts of Canada Geese were quickly dismissed as we realized almost immediately that they were Sandhill Cranes! They continued north-east passing right over Gill town hall and were obviously looking for a place to land. After a couple of minutes they landed in Upinngil's agricultural fields just west of Main Road, but surprisingly lifted up almost immediately and continued heading north-east where we lost them about a mile up the road. Sandhill Cranes - Upinngil Fields, Gill, Franklin Co., MA. April 14th, 2018. 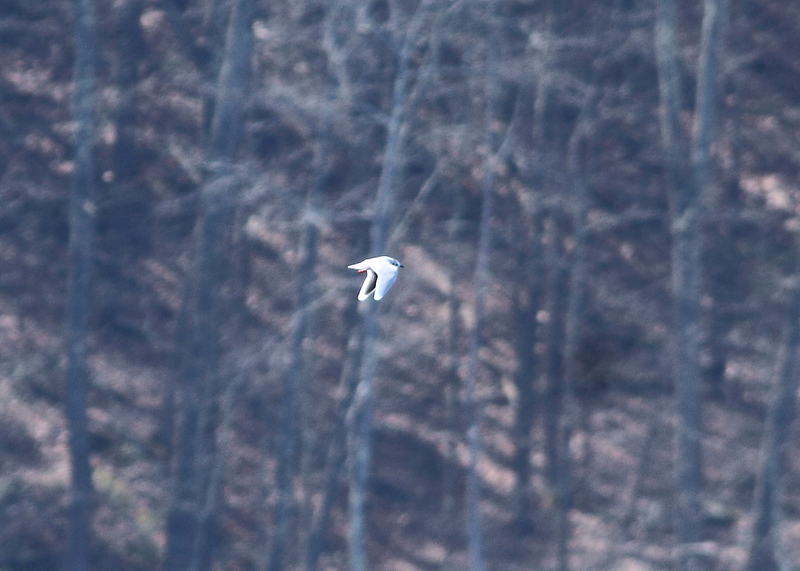 This was just my second observation of Sandhill Crane in Gill (and Franklin County), the previous record being of one calling high above Barton Cove on April 13th, 2015. Long-tailed Ducks - gracing the Turner's Falls power canal in heavy rain, Franklin Co., MA. April 4th, 2018. April opened with a nice wave of Eastern Phoebes in northern Franklin County with a concentration of at least seven birds around the fringe of Gill Elementary school fields on the 1st, and several other smaller gatherings at sites such as Barton Cove and Turner's Falls power canal. The phoebes must have shivered during the snowfalls on the 2nd but were already widespread and present around many properties in Gill by the 4th. Eastern Phoebe - newly arrived migrant, Gill Elementary School, Franklin Co., MA. April 1st, 2018. 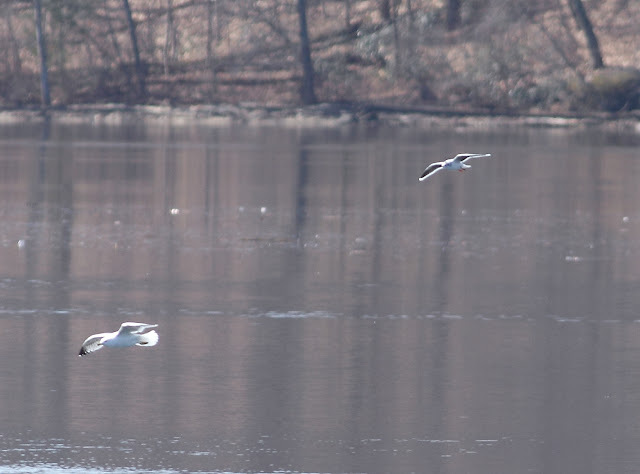 Finally, I managed to connect with some Tree Swallows on April 3rd, with three at Turner's Falls Rod and Gun Club and another three at the power canal hawking over the water in very gloomy conditions. Tree Swallow - over the Turner's Falls power canal in heavy rain, Franklin Co., MA. April 3rd, 2018. The 3rd also brought an impressive build up of waterfowl at Barton Cove, especially in late afternoon when over 145 Common Merganser, 85 Ring-necked Duck, 15 Wood Duck, and six Common Goldeneye were among the species present, highlighted by four Northern Shoveler this time composed of two pairs versus the three males and a female present last week. Also on the 3rd, a flurry of large gulls arrived at Barton Cove in the evening bringing two Iceland Gulls ( first-cycle and second-cycle). Barton Cove, Gill - relatively impressive gatherings of waterfowl. April 3rd, 2018. Northern Shovelers (four center left), Common Mergansers, Ring-necked Ducks and Wood Ducks among the species present. Iceland Gulls (2) - with Herring Gulls, Barton Cove, Gill, Franklin Co., MA. April 3rd, 2018. Second-cycle left, first-cycle upper right. Again on the 3rd, I caught up with some of the Red Crossbills present in the Montague Plains where I found two pairs in what I assumed to be the spot where breeding had been reported in the preceding weeks. Even so, I think I would have to admit to being more impressed with the gathering of around 150 American Goldfinches present in the same area, by far the largest flock I've encountered in Franklin County. The birds were very vocal, just about audible from the road but only truly appreciated by walking into the habitat some 300 meters from the road where I was greeted by absolute wall of sound coming from singing and calling American Goldfinches. 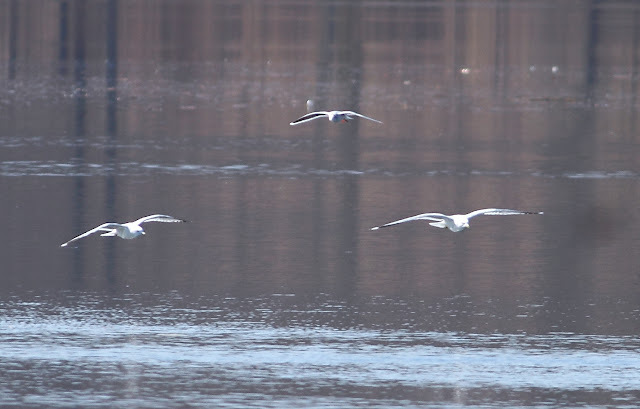 Oddly, when I returned to the site the following day (the 4th), most of the large numbers had moved leaving only 35 or so present in the same area, though intriguingly, I found another very large flock (80+) along River Road in Gill that day. Red Crossbill - male, Montague Plains, Franklin Co., MA. April 3rd, 2018. American Goldfinches - Montague Plains, Franklin Co., MA. April 3rd, 2018. Just a tiny fraction of the 150+ birds singing and calling about 1/4 north of Old Northfield Road. Unexpected and supplemented by another large flock of 80+ on River Road, Gill on the 4th. 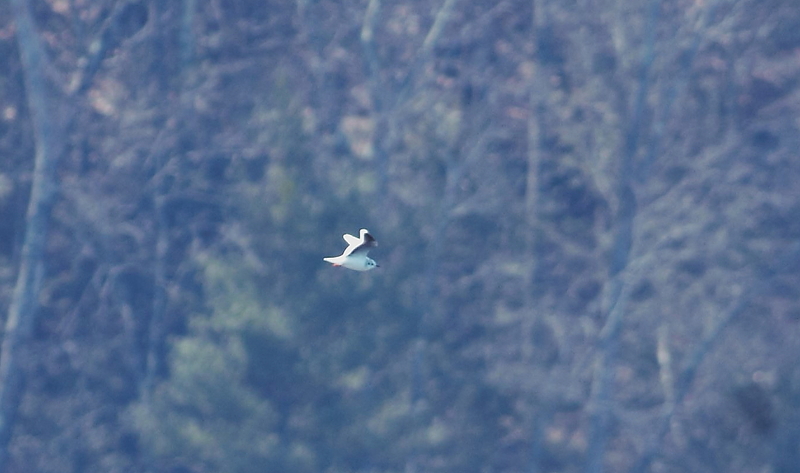 The 3rd also produced a fine male Northern Harrier migrating north through Upinngil Farm, neatly matching a cluster of late March/early April dates for other spring males in Gill in previous years. And on the 2nd, a surprise American Pipit in the arable fields along North Cross Road, Gill. Northern Harrier - male, northbound migrant, Gill, Franklin Co., MA. April 3rd, 2018. Inclement weather on the 4th produced yet more waterfowl arrivals with new birds including 17 Green-winged Teal at Barton Cove, four Lesser Scaup, a female Red-breasted Merganser and a whopping 175 Common Mergansers present, and highlighted by pairs of migrant Long-tailed Ducks at the Rod and Gun club, and at the power canal. Many of these departed on the following cold, clear night though a Lesser Scaup (female), a male Bufflehead and no less than 13 Common Goldeneyes were noteworthy at Barton Cove on the 5th. Woodland birding remains fairly quiet though singing Fox and American Tree Sparrows were present on North Cross Road, Gill on the 5th, along with a singing Winter Wren back on a traditional breeding territory. Further north, we chanced up a Hermit Thrush in the woods and a Red-breasted Nuthatch excavating a nest hole in Pisgah State Park on April 1st. Hermit Thrush - Pisgah State Park, Cheshire Co., NH. April 1st, 2018. Red-breasted Nuthatch - Pisgah State Park, Cheshire Co., NH. April 1st, 2018. American River Otter - Barton Cove, Gill, Franklin Co., MA. April 3rd, 2018. Briefly resting on floating ice during snow flurries.